„Radhouse“ is an innovative form of bicycle parking that combines the benefits of secure storage with environmental friendly solar electricity, and at the same time it is very space efficient . Stored in the Radhouse the bicycle is well protected against weather and theft and batteries can be charged. 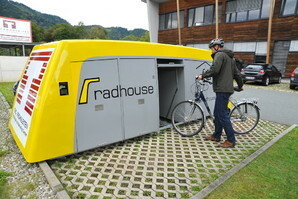 The “Radhouse” provides storage and charging for 5 e-bikes all in th space taken by 1 parked car. The number of owners of e-bikes is increasing which brings with it some specific infrastructure needs. Protection against weather and theft, and the opportunity to recharge batteries are the most important needs of e-bikes. To meet this demand, a local Styrian business has invented the bicycle storage “Radhouse” (a German wordplay which means “bicycle house”, but which also sounds like the word for Town Hall). A “Radhouse” occupies the same area as one car parking space but provides separated spaces for 5 e-bikes along with some equipment. It helps to close the multi-modal transport chain, especially for commuters who cycle to the train station and take the train to their workplace. During the day the e-bikes are adequately supplied. Additionally users have the ability to store belongings (e.g. rain shield, cloths) in the box. Electricity for charging is produced with photovoltaic cells assembled on the roof.>The Radhouse is equipped with a sophisticated electric locking system which makes it ideal for storing not only e-bikes but indeed any other high quality bicycle. The bicycle storage „Radhouse“ was developed and built by the Styrian business Pusch & Schninnerl in Frohnleiten (nearby Graz). Two “Radhouses” are being piloted for a test period in Frohnleiten, which is well suited to the trial because of the high number of commuters who go to Graz by train for work. The ratio of use to capacity is about 75 %. The electric locking system was developed by “Schrack Seconet” from Vienna. Implementation costs range according to the precise location from 10.000 € to 15.000 €. In winter the “Radhouse” can also be furnished with a system which warms the bike battery in order to avoid loss of power. A big advantage of the concept of “Radhouse” is that offers a lot of flexibility for adaptation to suit the demands of the multifaceted owner (e.g. access, accounting). There is a high potential for replication (e.g. municipality, business, administration) in order to complete the multi-modal transport chain.